Kim was a pleasure to work with. Very responsive with her communication! Tattnall treasure was a wonderful place to stay. Its within walking distance to the river & city market. We enjoyed the homey feel. Was very comfortable! Easy self-check in and someone was always available to answer any questions. Loved the property! Will be staying again! Kim was awesome and answered all my questions. Thank you, my group really enjoyed our stay. The property was well maintained, in a great location, and the owner was super friendly. We had a wonderful stay. The location of the property is perfect. The bed was comfortable and we slept great. We would definitely stay at this property again. Everything seemed straightforward via email was no need to contact team . Did contact team before initial arrival to confirm if it was OK to arrive a couple hours early . No problem arriving a little early . This property was heavenly!!! And in such an amazing location! The history relating to the Bonaventure Cemetery made it all the more special. A+++ Hope to return! Insightful, pleasant and straightforward (in a good way). The property was outstanding. Though we enjoyed Savannah, we probably won't return, as from our perspective, Charleston, S.C. has more to offer (compared to Savannah). We will go back to Charleston. If the property we rented in Savannah was available in Charleston, we'd rent instantly. Location, location, location. Parks, easy walk to historic district. We loved it. Quiet, nice small courtyard. Comfy bed. There is a hairdryer in the unit. It is in a closet, not in the bathroom. Thank you for your review. It was an absolute treat staying in this home. 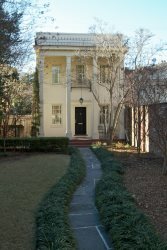 It was right in the middle of Savannah, but included a large private garden as well as parking. Great historic home! My experiences with Savannah Getaways representatives have always been very positive over the years. This is a comfortable, relaxing house with lots of space and amenities. I contacted Kim when I arrived and she was very helpful and accommodating when I arrived early and could not work the lock to get into the property. Everything was great....just as pictured and described. Communications were complete and timely. Such sweet ladies! Very knowledgeable and cheerful! Both seemed very willing to help out and explain things! I love that Mr. Mott gets involved with the guests! He is so very kind! I will be back! It was more than what I expected and very relaxing!! Perfect as can be!!! I have dealt with Kim and Lynn on numerous and occasions. Each time I am increasingly impressed with their friendliness, efficiency, knowledge, patience and priority to client satisfaction. We have stayed at Little Tara the past 7 winters. It and Savannah now feel like a second home thanks in large measure to the excellent service we have consistently received from Savannah Getaways. Very helpful, efficient and pleasant. Dealt with Kim and she was wonderful. Thank you Kim!! Very comfortable and fit our needs perfectly. We all slept well and found that the size of the house was perfect for 7 and could actually have accommodated at least one more. key pad on the front door - great idea - no keys to lose :-) One tiny point - the ice machine in the freezer isn't working; not a big deal - we bought ice. Everything else in perfect working order.